US Xpress is an interstate trucking company operating out of Chattanooga, Tennessee that employs just over 7,000 drivers and its vehicles travel roughly 616.6 million miles each year. US Xpress transports numerous forms of cargo, including hazardous materials, chemicals and volatile liquids and gases. Its safety record is far from the worst considering some of its competitors, but it has been involved in more accidents in the last two years than the previous two year period. Whenever a company is found to be involved in more trucking accidents in recent history than in its past, it reveals the need to evaluate that company’s policies and procedures to determine where it has fallen short. Studies conducted in 2012 and 2015 of all violations and accidents occurring within two years of each study have helped establish trends and allow us to determine whether trucking companies are making the appropriate efforts to improve their safety records. The data recorded about US Xpress suggests that it can make improvements in how it addresses vehicle maintenance and the transport of hazardous materials. 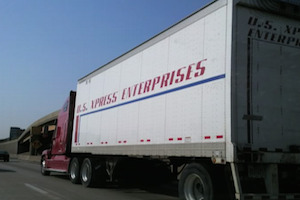 In 2012, US Xpress was subject to 7,057 vehicle inspections, and 969 out of service violations were reported. The out of service rate was 13.7%. The 2015 study revealed 1,145 violations resulting from 7,575 inspections and the violation rate rose to 15.1%, suggesting that US Xpress may be cutting corners in the inspection and servicing of its vehicles. This statistic is concerning, considering that US Xpress transports volatile materials that can have damaging effects on the environment if spilled or released due to an accident. The 2012 data also revealed that US Xpress had been cited for 42 out of service violations from a total of 908 hazmat vehicle inspections. The violation rate of 4.6% was higher than the national average. The 2015 report showed a slight improvement— 26 violations out of 746 inspections to comprise a violation rate of 3.5%. 583 accidents were recorded in the 2012 study and 189 of them resulted in injuries, which included 16 fatalities. The 2015 study reflected an increase in crashes, but a reduction in the fatality rate. Of 749 accidents, 232 resulted in injuries, and 12 deaths were reported. The driver out of service rate improved from 2% in 2012 to 1.5% in 2015. Of 13,865 inspections in 2012, only 275 violations were recorded. 204 violations were reported in 2015 resulting from 13,167 inspections. US Xpress is not the only trucking company with questionable vehicle maintenance data. The national average for out of service violations during inspections is over 15%. The drivers often take the blame during trucking accidents and their employers are more than willing to leave them out to dry to minimize their liability. If company policy or disregard for safety standards or laws directly impact the risk of being involved in an accident, that company must be held accountable and required to provide compensation to the victims harmed in crashes operated by its employees. Tire blowouts, brake failures and defects in hydraulic systems may all cause truck drivers to lose control of their vehicles and collide with innocent travelers on the highway. While drivers are also liable for any involvement that they have in accidents, real change needs to come from the way that trucking companies inspect and maintain their vehicles and in the safety training that is offered to drivers before they are allowed to operate a semi-tractor. The Rosenfeld Injury Lawyers LLC have helped hundreds of victims take on large trucking companies whose willful acts of negligence have resulted in traumatic injuries and loss of life. If you or a loved one has been harmed or killed in an accident with a US Xpress truck, we understand the physical, emotional and financial impact of your injuries and will fight to make sure that you can move forward with your life following your accident. The compensation you may be entitled to will include the cost of your medical care, physical therapy, ongoing care, lost wages or loss of livelihood, out of pocket expenses and your pain and suffering. Contact us now to schedule a free consultation with our trucking accident law team so that we can collect the information we need to evaluate your case and answer your questions about truck accident law, the legal process and the amount of compensation you may be able to expect from a settlement or judgment in your favor. Should we be unable to secure any recompense on your behalf, our time and services will be completely free of charge.